Investors had another change of heart Thursday and continued selling stocks again after a one-day burst of optimism. Stocks ended Thursday at 12-year lows, more than wiping out a one-day rally seen a day earlier. Investors are contending with more disheartening economic readings, new concerns about the stability of General Motors Corp. and ongoing uncertainty about the financial system. The Dow Jones industrial average closed down 281 points at 6,594. The S&P 500 closed down 30 at 682, while the Nasdaq composite index closed down 54 at 1,299. About 10 stocks fell for every one that rose on the New York Stock Exchange. Volume was a heavy 1.8 billion shares. "I think the mood is quite dire," says Steve Massoca with Wedbush Morgan Securities. "I mean I think people are extremely concerned about what's going on in the banking industry." That unshakeable fear has infected the entire market, including small investors, reports CBS News Business Correspondent Anthony Mason. "People are concerned that the contagion will move on to other industries, so that's why you see broad based selling to the stock market," Massoca says. Since October, investors have withdrawn $180 billion from mutual funds. For the first time, since records started being kept in the 1970s, five of the 30 stocks in the Dow: Citigroup; General Motors; General Electric; Bank of America and Alcoa - are trading below $10. And a sixth, American Express, is threatening to join them, Mason reports. The beleaguered banking sector posted some of the steepest losses. Shares of Citigroup Inc., still shaky despite receiving billions in government aid, sank below $1. General Motors, meanwhile, dropped below $2 as it warned of possible bankruptcy. The market is also extremely anxious ahead of Friday's February Labor Department report that is likely to show the loss of hundreds of thousands of jobs. Even some positive news, including some better-than-expected retail sales and factory orders, was not enough to stoke investor confidence. The reports failed to show a significant improvement and so the market gave back its big gain from Wednesday, said Doreen Mogavero, president of brokerage Mogavero, Lee & Co.
Stocks fell initially after China deflated investors' hope that it would take new steps to stimulate its economy, but the discouraging economic data sent stocks even lower. The hope that China would unveil more government spending to help its economy was a major factor behind the market's bounce Wednesday, which sent the Dow Jones industrials up nearly 150 points. The rally followed a five-day pummeling. "It's been this continuous (cycle of) hope leads to disappointment," said Todd Salamone, senior vice president of research, Schaeffer's Investment Research. Investors moved out of stocks and back into safer assets like Treasurys and gold. "We have the same story," said Alan Skrainka, chief market strategist at Edward Jones. "We have concerns about the stability of the financial system, concerns about the economy getting worse, and just a lack of confidence." Wednesday's rally, built on the hope that China could boost its spending, showed how hungry the market is for good news, analysts said. But there are just too many other dismal economic factors to contend with that make a rally hard to sustain. Since the Dow and the S&P 500 index plowed through their November lows last week, dashing hopes that the market had indeed hit a bottom, investors have been left wondering how much lower the market can go. At the same time, there is a contingent of investors with a "why sell now" mentality who are fearful of missing the next rally, Salamone said. "A lot of people are banking we can't go much further, but if you look to the '30s, we could indeed go a lot lower," he said, referring to Wall Street's huge losses during the Great Depression. "Those are the very people that represent selling pressure in the future." Discouraged by little evidence that Washington's efforts to stabilize the economy are working, investors have lost faith in the administration, he said. "At this point, you've got to be asking will anything help?" Salamone said. "The fact could very well be that the government can't do very much. They may be able to eliminate some of the pain, but at the same time they may be simply prolonging what inevitably has to happen, which is continued deleveraging." Among Thursday's gloomy reports, the Commerce Department said orders for manufactured goods fell by 1.9 percent during the first month of the year. While this was better than the 3.5 percent drop economists had expected, it marked a record sixth straight month of declines. Meanwhile, government data showing that initial unemployment claims fell more than anticipated last week failed to buoy stocks. Economists surveyed by Thomson Reuters/IFR predict the Labor Department on Friday will report that U.S. employers slashed 648,000 jobs in February - more than the 598,000 jobs cut in January. "We know that there are lots of job losses," said independent market analyst Edward Yardeni. "The initial claims data didn't change that perception." Rising unemployment is of particular concern because it means many consumers have less to spend. And consumer spending, which accounts for more than two-thirds of U.S. economic activity, is crucial to helping the economy turn around. A handful of better-than-expected retail sales reports, including one from Wal-Mart Stores Inc., weren't enough to convince investors that consumer spending is improving. The future of General Motors also plagued investors. The automaker said in its annual report that auditors raised serious doubt about its ability to continue operating. GM has already received $13.4 billion in federal loans, and is seeking a total of $30 billion from the government. GM dove 38 cents, or 17.3 percent, to $1.82. Negative comments from Moody's Investors Service weighed on already depressed financial stocks. Concerns about capital levels led the ratings agency to downgrade the ratings of Bank of America Corp. and Wells Fargo & Co. Moody's also lowered the outlook on JPMorgan Chase & Co.'s ratings to negative. Bank of America shares dropped 32 cents, or 8.9 percent, to $3.27; Wells Fargo plunged $1.46, or 15.1 percent, to $8.20; JPMorgan tumbled $1.81, or 9.4 percent, to $17.49. Government bond prices rose. The yield on the benchmark 10-year Treasury note, which moves opposite its price, fell to 2.83 percent from 2.98 percent late Wednesday. The yield on the three-month T-bill, considered one of the safest investments, slipped to 0.22 percent from 0.25 percent Wednesday. Gold prices advanced, even as the dollar rose against other major currencies. Light, sweet crude fell $1.08 to $44.30 a barrel on the New York Mercantile Exchange. Markets overseas were mostly lower. 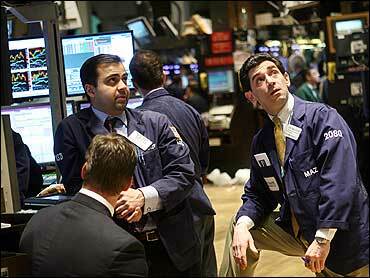 Britain's FTSE 100 fell 3.18 percent, Germany's DAX index dropped 5.02 percent, and France's CAC-40 fell 3.96 percent. Earlier, Japan's Nikkei stock average rose 1.95 percent after Wall Street's Wednesday rally, but Hong Kong's Hang Seng index fell 0.97 percent.